Wow, tabs in text do not work right. I was just trying to line some things up vertically in paragraph text, using tabs. This does not work. Aside from UI problems, tab functionality appears to be significantly broken. First, there's no on-screen indication of where the tab stops are, so there's no way of knowing which one you're sitting at, let alone dragging it to adjust it. You also can't choose a position at which to add a tab stop. Also, you can select a tab, delete it, and then re-add it... only to get a totally different-sized tab. And you can select some tabs by clicking in the middle of them... but not others. Something seems amiss internally there. I decided to add a ton of tab stops, so I could be sure to have enough granularity to put things where I wanted. This still produced wildly varying tab widths throughout the line of text, and different tab stops from one line to the next.. despite my having had the entire paragraph selected when I made the changes (as noted below). Aaaand I just discovered that the space bar is now inserting tabs. WTH. About changes being made only to the line in which the insertion point is sitting: While this is indeed how word processors work, one could argue that this object is a paragraph object and thus one would expect changes made at the paragraph level to apply to all the lines. But that's a minor quibble and debatable; the other problems are way bigger. Screen grabs attached. This level of text editing is something better suited to something like Affinity Publisher. This has a Frame Text Ruler allowing you to see your tab stop markers and also the ability to see special characters so you can see exactly where your tab stop characters are being placed. However I will speak to development about getting these included in Designer as it does make tab stop editing much easier. I do believe this would help the confusion! Regarding the 'Unlabelled mystery thing' that is the Default Tab Stop value. On Mac this has a Tooltip, but on Windows that seems to be missing so I'll get that passed on to development. The function of this is that this is the default length of the tab stop when you press tab and also the value used when new Tab Stops are added. Not only that, but Publisher has tables which would make this kind of formatting much easier than trying to use tabs for it. The "plus and minus" I believe the "minus" is representative of a tab as this button should insert a new tab stop in the list below it. Those tab stops are used first, after which any additional tabs use the default width as @Sean P described. Based on that, I would argue that they are in the wrong order - the default stop width is used AFTER the ones that are in the list so the list should be above that control rather than below it... but such is life. 1. The mystery thing's label should not be a ToolTip. There's ample room there to label that control, as all controls should be labeled. 2. If the product can't perform the function properly, the function shouldn't be offered. 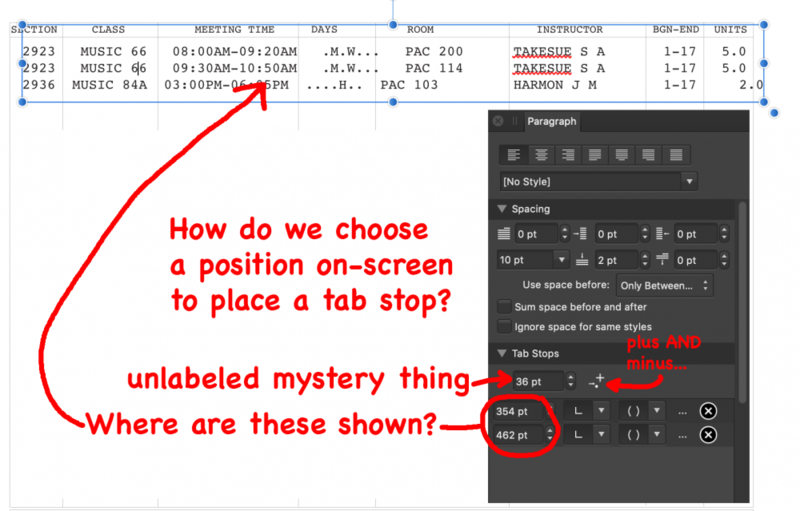 As it stands, the tab functionality is profoundly broken and is a disservice to users because it wastes their time. Nor is it reasonable to suggest buying a desktop publishing product and round-tripping an illustration through it to get one paragraph of text lined up. Don't take this as a big slam; I salute Affinity for stepping up with fresh products to save us all from Adobe's BS. But this functionality blows. Because we have tab stops in AD we should get a better usability (same level like other functions) otherwise it is criticized. And Sean, is there still hope for optical tab stops (e.g. the H [aitch] would exactly start/end/center at the tab stop position)? That would be an USP. Maybe a good James Ritson tutorial video on this would help!! Problem is, he would first have to find a workaround to make the current user-hostile Designer tabs vaguely usable. I'm trying to use tab stops in AD. Are there any useful videos online that teach about using this feature? Most other features seem to be covered, but this one is probably hidden somewhere. Here's how I figured out this insane setting panel. I only turned on snap to grid to help see everything. Hope this helps. Thanks ev. I'll examine this more fully... next time I'm unfortunate enough to be trying to line up some text.